I have had the opportunity to experiment with a number of wearable devices during my time working in the LINK Research Lab. We have looked at a range of devices that can collect physiological data for our research related to well-being in a digital age, ranging from a consumer-grade watch to research-grade wristband to bioharness and more. 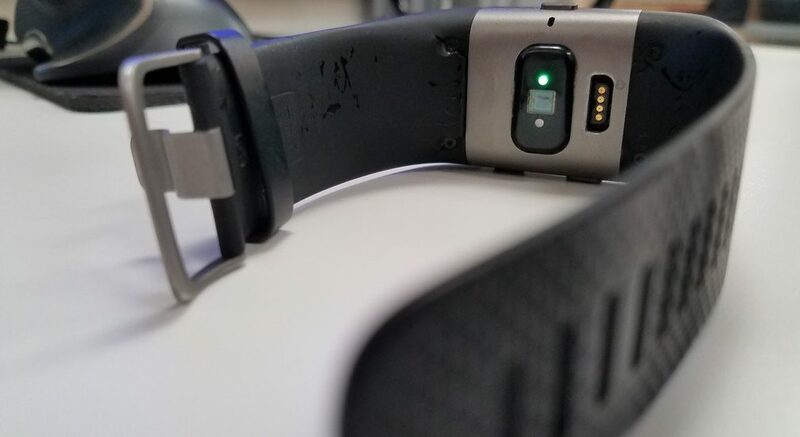 All of the devices that I have helped test have had their strengths and weaknesses, but one of the favorites that I have used is the Fitbit Surge. I have had this device for sixteen months and I believe that it has been out for two years, so there are a number of newer competitive options out there, but this device still ranks high on the list for me. The fitness tracker is a bit more expensive than some devices at $249, but one of its best features sets it apart from other ones that I have seen: standalone GPS. Currently, the Surge is the only Fitbit device that has built-in GPS that does not require a connection to a smartphone to operate. After experimenting with other devices, such as the Sony Smartwatch and Apple Watch Series 0, this watch provides relatively accurate tracking without forcing me to carry my Samsung brick phone with me when I exercise. It is not always the most precise as it sometimes cuts corners and zigzags from time to time, but it is not incredibly off base. For all intents and purposes, the Surge is a current smartwatch as much as it is a fitness tracker. If I have my phone nearby, I can use Bluetooth to receive call and text notifications, control music, alarms, and more. This can provide a great deal of flexibility and is useful if you are waiting on a call, but don’t have your phone glued to you. None of these features are essential and may be unnecessary for the common user who might want a lighter device. Like most smartwatches, the Surge has a larger face with touchscreen capability, which people will most likely love or dislike, and is backlit so you can read it at night. Using Bluetooth does drain the phone’s battery as expected, but it is not completely unreasonable and I can keep a charge on my phone throughout the day. For the watch, I can typically go 3-4 days between charges without issue if I do not use the GPS. 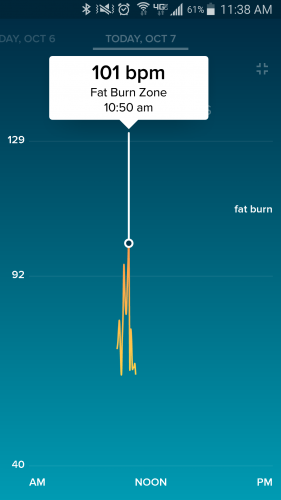 When using GPS+HRM (heart rate monitor), I have been able to get more than six hours on a long hike (I did not run it down to 0%, but it was getting close – Fitbit claims 10 hours). Most people will not need this length, so it is reasonable enough for marathons, hikes, and more with a charge later that evening. The Surge does use a proprietary charging cable, so forgetting to bring it on a trip is a pain. I can typically charge the device quickly and have never needed more than around an hour and half to do so. Heart Rate – I chose to lead with this one as it has faced the most scrutiny including litigation. I have done a little testing on my own, such as cross checking my Fitbit during a medical appointment where someone checks my pulse, and it is relatively close. The feedback data is not 100% real time and seems to take a little bit to catch up. For example, I have taken a break during exercise and my heart rate has slowly increased for a few minutes before decreasing. I do not take this incredibly seriously, but do use it for a rough approximation. It was interesting to see how much my heart rate went up when presenting at a conference last fall (image is from my talk at Learning with MOOCS III)! Steps – This is the goal that I aim for each day – 10,000 steps. This is really an arbitrary (recommended) number, but it does help me feel like I have done some low-impact exercise each day. The app on the phone will give a nudge when you were within 2500 steps or so to finish your goal and I must admit that it has motivated me to be a bit more active. We have done a number of step-based competitions at my work and this tracker has helped me with it. The one issue that I have the most with counting steps is that I am almost 6’4″ tall and when I walk with a far shorter colleague, they often get a few hundred steps more than me over the same distance. This forces me to walk more distance during these competitions to have a chance at winning. Another important issue is that it doesn’t get every step. Through testing, I typically don’t get false steps, but I also only get between 85-95 steps out of every 100 that I take. This is a bit unfortunate when I try to reach my step goal or am in a competition. Calories – To be honest, I almost never look at this feature and instead focus on my activity. It estimates how many calories I have burned that day, but I am unsure how accurate it might be. Distance – I don’t look at this feature much since the steps determine most of the distance, but occasionally it has been useful. For example, I climbed a mountain in Big Bend National Park and the steps were significantly more than the distance if I was walking on flat ground. This provides greater context, along with floors climbed, but otherwise does not have incredible value in my daily life. Floors Climbed – This feature has been mostly accurate. I tested it in numerous stairwells and it does a pretty good job determining the number of floors that I walk each day. Sleep Monitoring – I used this early on, but stopped using it to give my arm a break from the wristband. The tracker did notice when I was a bit more restless and moved around more, as well as times that I got up at night. I did not find it incredibly useful as I am a relatively boring sleeper, but it did a pretty good job figuring out when I went to bed and woke up each day. Exercise Tracking – You can load up to seven predetermined activities onto your watch at a time. I have really only used it for hiking, but do have other ones such as tennis and yoga. I cannot speak to the value of these options, but assume that it is useful for the personal records of the mobile application. With regard to quality and service, the tracker has performed well. It has frozen a few times, requiring a hard reboot, but returns to normal without issue. I can clean the device without issue and it is water resistant as advertised. The screen is durable and resistant to scratching. The biggest issue that I have seen with this tracker (and some of my peers’ Charge HRs) is the band. My band did not break all the way through, but was slowly starting to tear apart where it connected with the watch and would have come apart eventually. I also had the clasp pop off with relative ease and it became lost during one incident after my warrant had expired. I figured that I was out of luck, but I decided to contact Fitbit’s service department about a replacement part, of which there is none. They saw that I was an avid user and permitted me one new device free of charge. They were quick and courteous, and my device was to me quickly. Based on my experience and some of my colleagues’, Fitbit does seek to excel in the customer service arena. Regarding the Fitbit application, it has a relatively clean layout that is easy to use. It neatly presents information and is mostly customizable. You can easily see most of your data going back over a long period of time. You can also set and adjust goals as needed, and the app celebrates the user’s daily accomplishments. One of the interesting facets is the social connectivity and peer nudging. I have a number of friends that I can associate with on the device, but the best option has been certain competitions. The most frequent competition for me and various friend groups has been Workweek Hustle where everyone who joins is in a competition to get the most steps throughout the week. The winner gets bragging rights and an electronic badge. There are other badges, with most being individual accomplishments. The badges are interesting, but not really motivating; however, the competitions have been for me. I have heard some people mention that the competitions eventually becomes demotivating for them, but that has not been the case for me. Perhaps I am a bit too competitive? Overall, I have enjoyed the device and would recommend it for general use. I am wary of its use for research beyond some approximated and aggregated numbers, but it is useful to increase activity and help users determine their desired exercise goals. Happy walking! 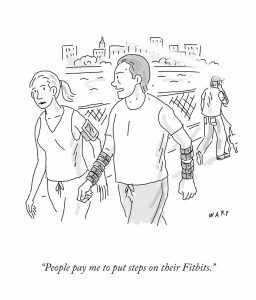 Just after posting this, I saw Audrey Watters’ take on wearables and learning analytics. She asks some of the tough questions around using wearables to collect data at education institutions. An example about tracking errors: “These errors are pretty important if you’re making decisions about your diet based on the data you glean from your fitness tracker– like should you have a McDonald’s Cheeseburger or another glass of wine. These errors are really important if someone else is making decisions about you based on this data – like your employer deciding whether your participation in the company wellness program is adequate. Or your health insurance company deciding whether to deny you coverage based on your physical activity or lack thereof. Or your school tracking how much you exercise and what you eat and how much (and where) you sleep and giving you a grade for it.” Audrey also mentions the Oral Roberts requirement of wearing Fitbits that collect “learner data” (as she put in scare quotes) before asking over a dozen important questions about important considerations before doing research or broadly implementing a wearable policy. Check it out!